Our color coded, progressive systems of therapy bands, balls, and tubing can assist clinicians in providing the challenge needed to help patients regain strength, range of motion, balance and coordination. 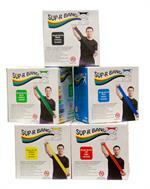 Economical yet engaging, therapy bands, balls and tubing are appropriate for most ages and diagnoses. The positive reinforcement and feedback provided by these simple therapeutic tools can encourage patients to progress toward a life with fewer restrictions.